An interesting take on how Twitter has taken over our lives caught my attention in The Wall Street Journal this morning. The reporter essentially talks about how her addiction to social media—and Twitter—has reduced quality time spent with family and even gotten her husband on her case about always being on the phone. "I am online way too much. I check email. I check Facebook. I check Twitter. I check my email again. Part of the reason is because I'm a working mom and I text with the baby sitter throughout the day. There is also professional necessity. Not only do I often write about social media, but I rely on technology to let me work from home when I can." Here's the thing: I am a very active tweeter. And there are several reasons behind my energetic pursuits of fitting the message in every blog post and article we publish in 140 characters. 1) Community: Twitter has provided me with a very diverse community of individuals who are eager to engage, argue and collaborate. At Vault, it is my team's primary job to act as connectors between our widespread communities of job seekers, students, career changers, recruiters, HR managers, and decision makers. And Twitter has provided me with the perfect discussion forum for much of this connectivity. 2) Soundboard: Without the 20 odd tweets I send out every day, I wouldn’t get any work done. Sounds counter-intuitive, I know—but it's true. You've got to go where your audience is. Much of our readership is very actively engaged on social media. They have a voice and they like to use it—and as a blogger, hearing what's working and what's not is unarguably essential. 3) Collaborations: And of course, without Twitter, I wouldn’t have made HR Examiner's Top 25 HR Digital Influencers for 2011 or named among the Top 100 Thought Leaders by Trust Across America. Nor would I have been able to successfully put together our recent panel on responsible business with Carol Sanford, Jeffrey Hollender, Sarah Murray and Bank of America, or been able to interview thought leaders like Campbell Soup's Dave Stangis, PwC's Shannon Schuyler, EMC's Kathrin Winkler and many others—and collaborated with enterprising students like Ashley Jablow, Catherine Chong, entrepreneurs like Myles Lutheran and the EDF Climate Corp fellows, or published the much-referred to series on job hunting in CSR. 4) News: Yes, believe it or not, Twitter has become a significant source of my daily news. With the help of coordinated lists, I can scan the morning news in one stream all at one source. 5) Innovation: How many times have you read an 800-word article in one the mainstream newspapers and thought "Wow, that’s interesting, I wonder how I could learn more" or "I'd love to get involved" but haven’t known what to do next? Well, because it's so easy to connect with others on Twitter without having to jot down strenuous emails or phone calls, now you can! Is it any wonder that every media outlet in the market today has multiple Twitter accounts? As for companies, the channel has not only become an effective way to crowd-source solutions (with minimal investment) but offered them, for the first time, the opportunity to pursue a dialogue with their stakeholders instead of relying on traditional one-way advertising. Full disclosure: I don’t use Twitter for personal conversations because I don’t believe in advertising my every feeling or thought. At the end of the day however it comes down to this: Twitter has provided this blog with a community of collaborators, creators and connectors. And while @VaultCSR has assumed a personality of its own, it has become an incredible connecting point for those interested in pursuing or shaping responsible careers. 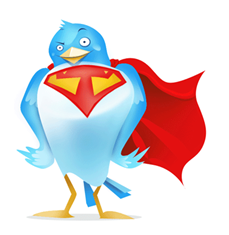 And in order to continue striving for that goal, I'm happy to be called the mad tweeter.